Praise for Management Accounting Best Practices “It doesn’t matter where you start reading, even the most experienced accountant will find some useful ideas.” —Alan H. Boycott, Chartered Accountant, Düsseldorf, Germany “This is one of the best books about new accounting practices in practical accounting. 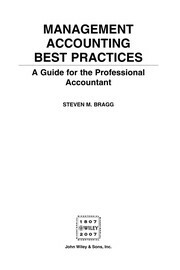 I highly recommend this book for accountants of all levels.” —Andrei Ralko, Controller, International Center for Transitional Justice, New York, NY The only practices worth followingare the best practices… Destined to become an essential desktop tool in helping professionals make management decisions in accounting, Management Accounting Best Practices introduces over 100 best practices from accounting expert Steven Bragg for questions such as: How does the system of interlocking budgets work? What does a sample budget look like? What best practices can I apply to the budgeting process? How can I integrate the budget into the corporate control system? How do throughput concepts impact the budget? Now, when members of your management team come calling with questions, you’ll have the answers at your fingertips, in Management Accounting Best Practices. It’s the easy-to-use, daily reference manual for every accountant in a management position.